On Nov 12. 2010 astrologer Andrew Bevan wrote for Skyskript.co.uk saying that the apparent stationary motion of benefic planets Jupiter and Venus on Nov. 18. could forewarn and be related to a forthcoming announcement of a Royal Engagement. No more than 4 days passed before on Nov 16. the happy news was released from Clarence House announcing the engagement of Prince William with Kate Middleton. Prince William is born on June 21. 1982, look here. Kate Middleton is born January 9.1982, look here. 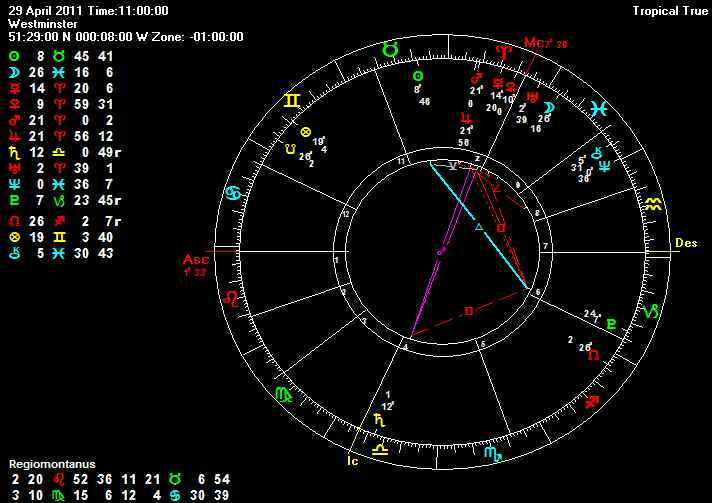 The Moon holds a special position in the chart and is placed towards the end of the sign Pisces, the Fish. This could be a special sign or accentuation in the chart which translates into meaning that after the happy couple themselves it is the Prince's mother, Princess Lady Diana, who through her omnipresence will be the focus of most attention. The Moon's position tells a story both about what has past but also of that which yet is to come - and while the Moon travels forwards to the next sign (according to the directions of time) the question regarding who is to take over the duties after Elizabeth II may be decided. However, another option is that the couple could be enthusiastic to form a family, and after 3-4 months it is possible the news of a child may appear in the horizon.